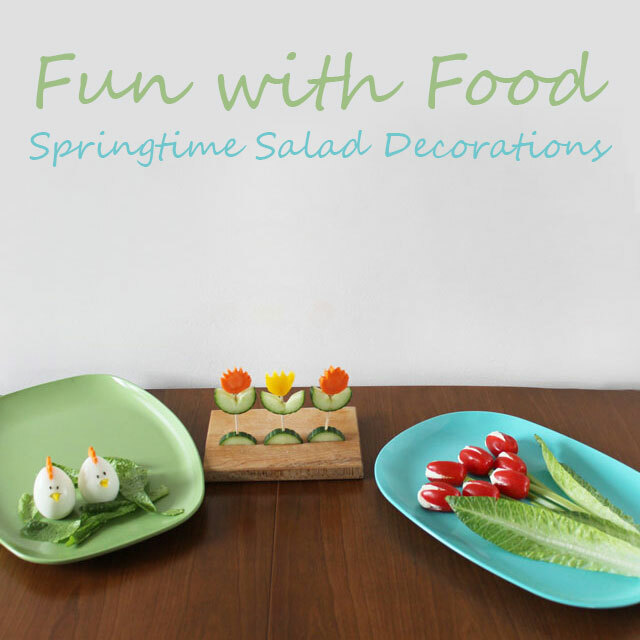 Here are a few ideas for ways to add fun and tasty decorations to your springtime or Easter table. 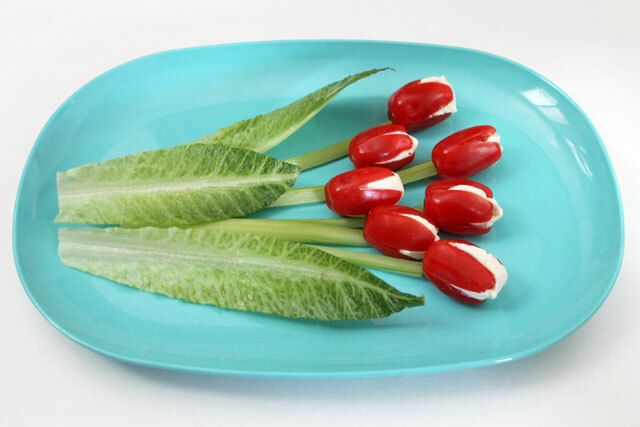 First up we have an Hors D'eouvre Plate that looks like a bunch of tulips using grape tomatoes, cream cheese, seasoning, celery stalks and leaves of romaine lettuce. To make these : mix some cream cheese with onion powder, garlic powder and salt, the quantities of each being up to you. Basically, you want to leave the filling white in colour, so those three white seasonings allow for that. 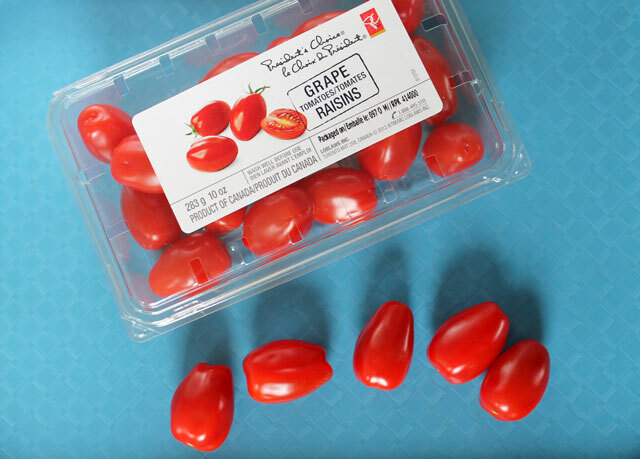 Then cut your grape tomatoes lengthwise, almost to the base of the tomato but not all the way. You'll make two cuts, forming four petals. Then pack your cream cheese mixture into a thick plastic bag and cut a small hole in the corner, to make yourself a piping bag. 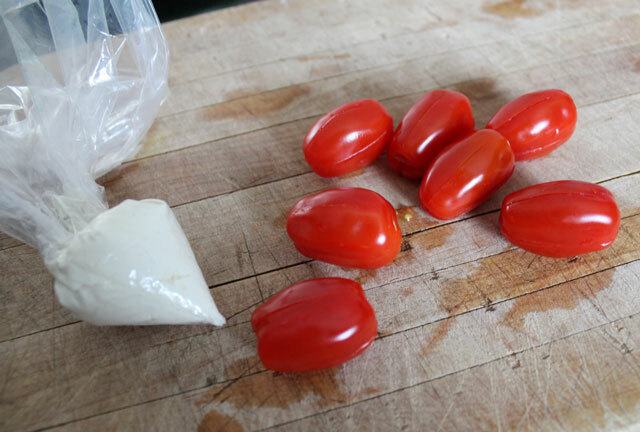 Stick the working end down into the tomato as far as you can, and pipe in the cream cheese. 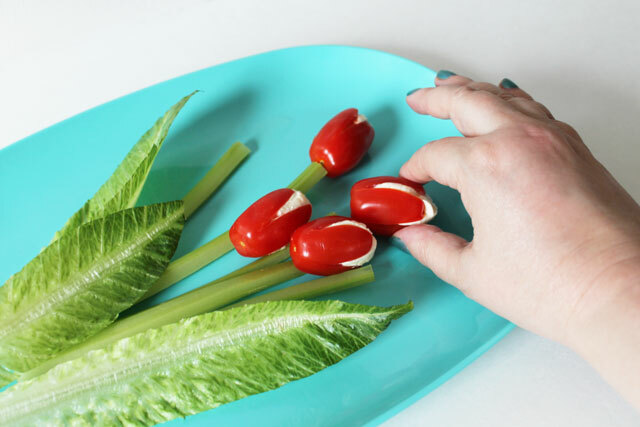 To make the stems, cut your celery into thin strips. 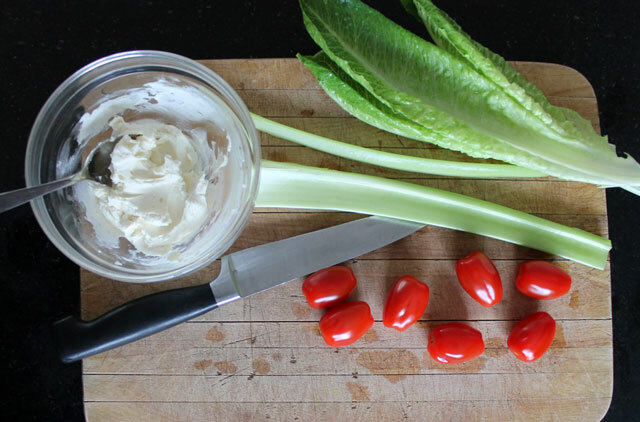 Then the leaves are made from trimmed romaine lettuce leaves. 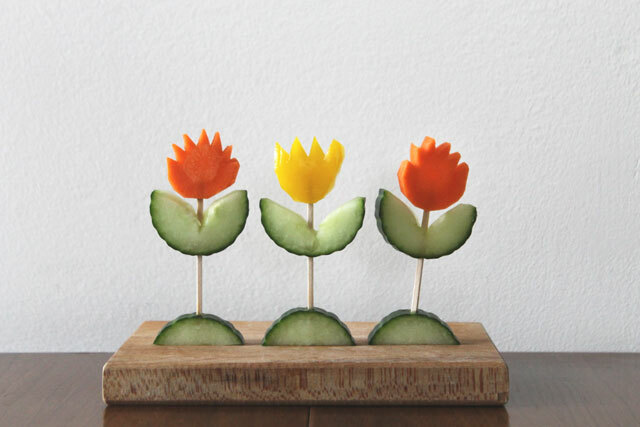 These are made from a disk of cucumber (English Cucumbers -- those long ones with the thin skin -- work best), which you cut across about 1/4 of the way, to make a base for the flower. Then cut the other 3/4 of the slice so it looks like two leaves. The flowers are cut from carrot disks and peppers. Stick the three pieces together with a toothpick. 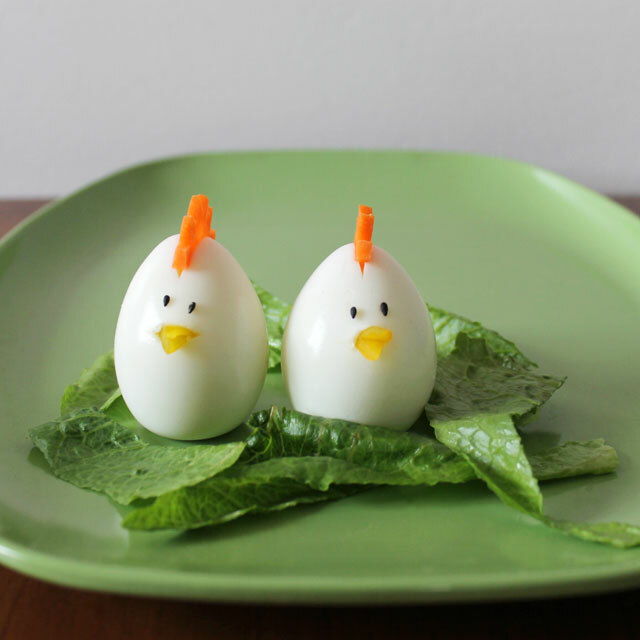 Finally, we have some hard boiled egg chicks. 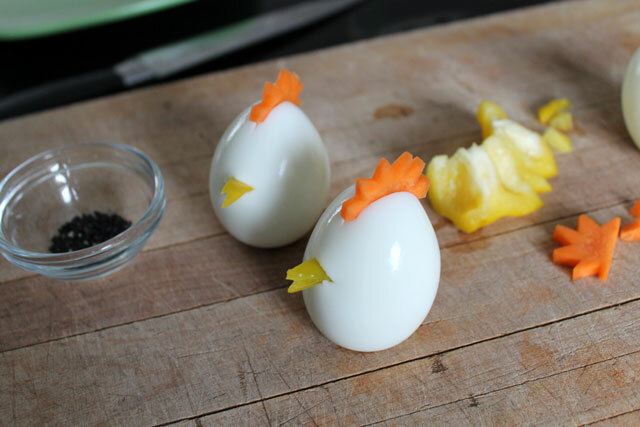 To make these : Boil your eggs and allow to cool enough to handle. (I needed some instruction on how to make boiled eggs that don't crack in the pot, which are posted here.) Peel the eggs and make a slit in the top (which will be the head) and a smaller one in the front (that will be for the beak), by sticking a sharp knife directly into the egg. My eggs had a flat side on the bottom so could stand up on their own, but if you need to you can cut the bottom of the egg to give it a flat bottom. Using a very thin disk of carrot, cut the chick's crown, shaping it with spikes on one side, and stick it into the head-slit. Then cut two thin small triangles for the beak. I found it easier to insert them into the face-slit by holding them together and sticking them in. Finally, make some eyes with black sesame seeds. I used sterilized tweezers to place those on. 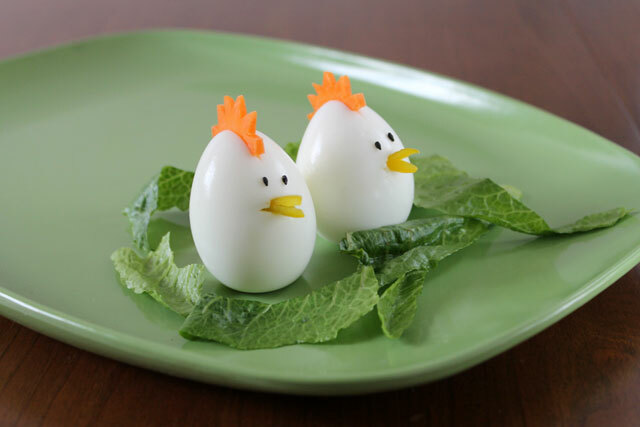 They just stuck to the eggs by themselves. 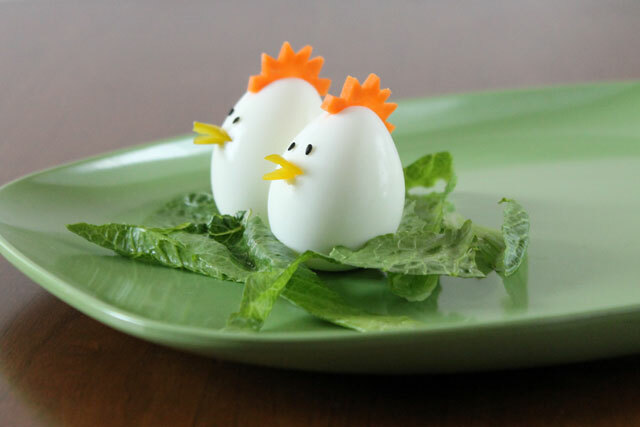 Place your chick in a nest of shredded green lettuce. 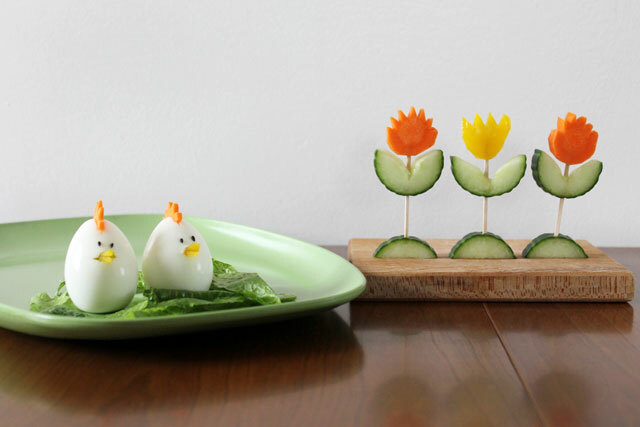 Thanks for checking out my post and I hope you have some fun playing with your food. Oh my, I am in love! Must be one of my favorite food posts ever! 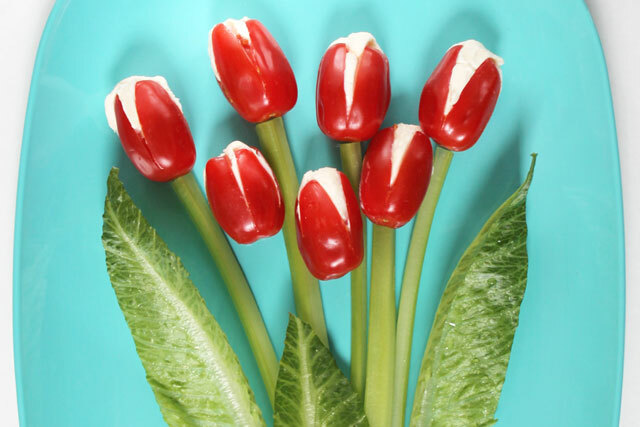 Those tomato tulips are beautiful – they look very martha stewart! oh my gosh, these are so freaking cute!! love them. 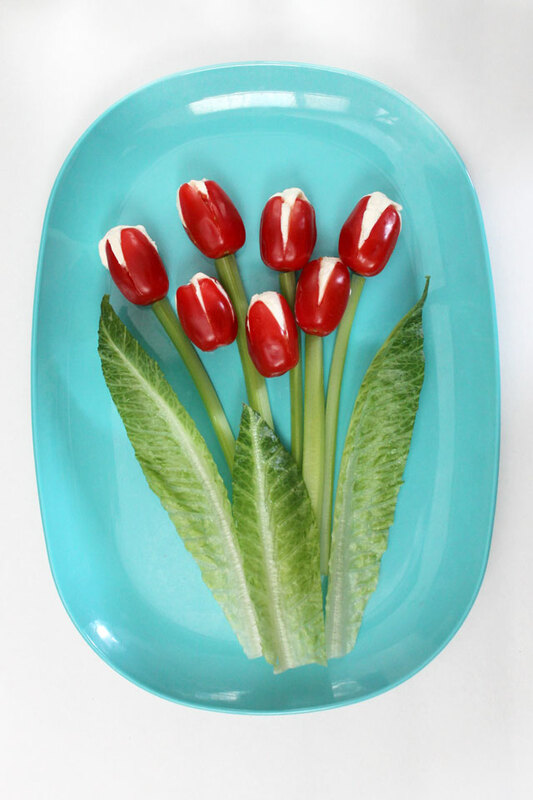 so spring-y and fresh, and the veggie flowers would work all summer long, actually. Loulou, you’re a genius. 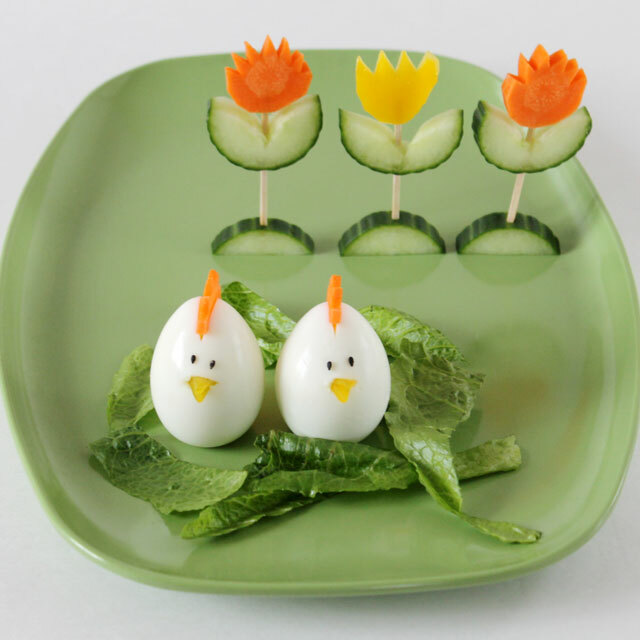 This is the most adorable food post! 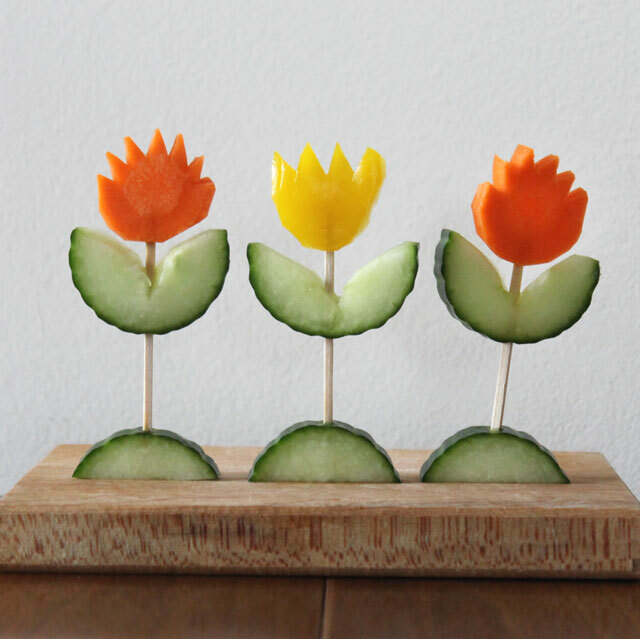 Thank you :) I used a bit of yellow bell pepper, cutting two small triangles and then slicing those to be thinner. They make the top and bottom of the beak, with the skin sides facing outwards. Hope that makes sense!